Whales are social creatures with a remarkable ability to communicate with one another over long distances using sounds. Male humpback whales, for example, can sing for days on end over mating grounds to attract the ladies, or over feeding grounds such as the ones on Georges Bank (where we are!) The acoustic behavior of sperm whales may even provide for distinct cultures within the species. Given these vocalizations, it is possible to monitor the distribution and behavior of acoustically active marine animals using special recording units called “marine autonomous recording units” (MARUs). For the past few days, we have been zig-zagging and loopty-looping around Georges Bank to retrieve several of these MARUs (track our ship’s course here). MARUs are little buoys designed to sit on the ocean floor and record all sounds within a certain range of frequencies. The MARUs we retrieved during this cruise have been on Georges Bank since the March cruise on the Delaware II (see Chief Scientist Allison Henry’s blog post). Bioacoustician Denise Risch sends a signal to the MARU. 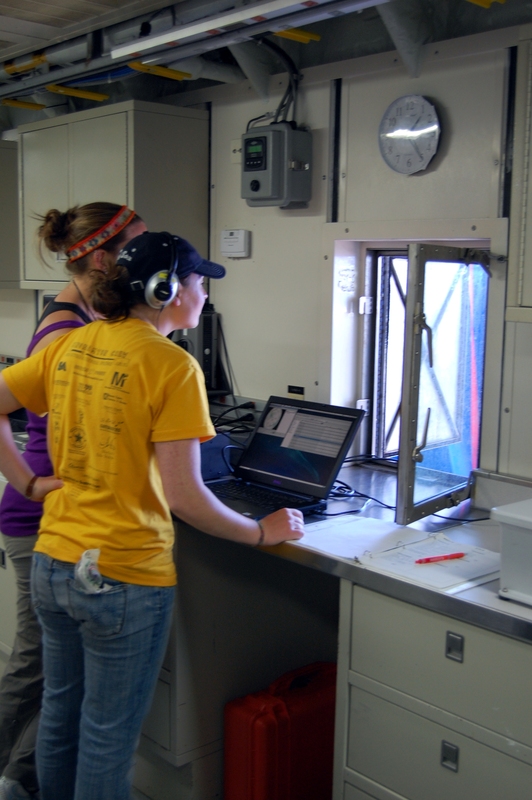 Research analyst Genevieve Davis and intern Julia Luthringer listen for a response from the MARU. 3. Upon hearing confirmation that the buoy is indeed in the area, the bioacoustician can send another signal to the buoy telling it to burn the wire anchoring it to the sandbags on the ocean floor. 4. The buoy is free! It floats to the sea surface and is retrieved from the side of the ship. 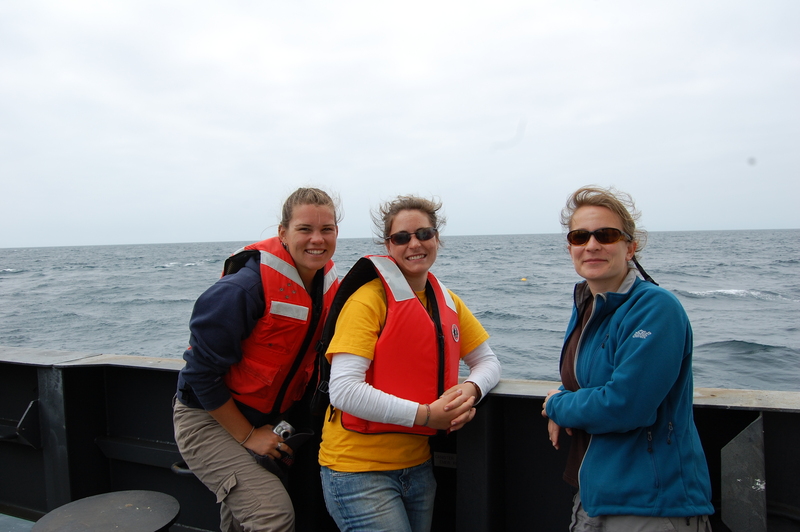 Denise Risch, Genevieve Davis, and Julia Luthringer wait for the ship to approach the MARU (small yellow dot in ocean). 5. 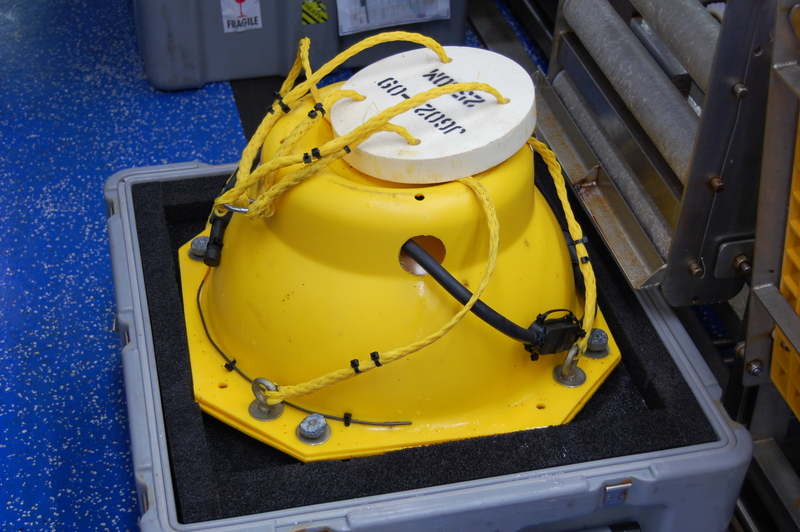 Data is retrieved from flash memory on the buoy for further analysis. MARU ready for data retrieval. What will these MARUs be able to tell bioacousticians (scientists that study sounds produced by living organisms)? Lots! 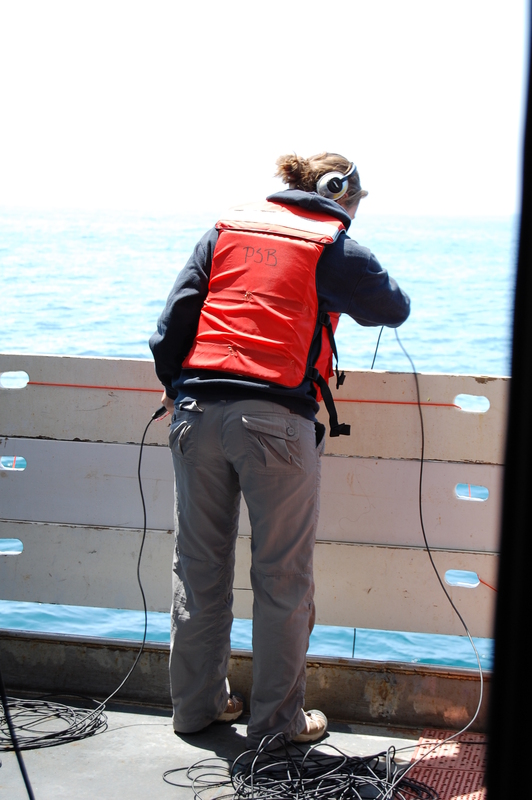 Using passive acoustic monitoring (recording the sounds that marine mammals make), scientists can study the distribution of acoustically active mammals and can couple distribution data with environmental measurements of the area to identify relationships between conditions on the ocean and acoustic activity. Scientists can also distinguish whale species based on their sounds, so certain species of whale can be monitored. Physics break: Why do you think whales have evolved to use sound rather than sight or smell to communicate underwater? I have been amazed by the amount of maintenance being done while we are underway. Even with a relatively new ship like the Bigelow, there is always something to be done, whether it be grinding away at the deck for subsequent repainting or fixing a malfunctioning pump. 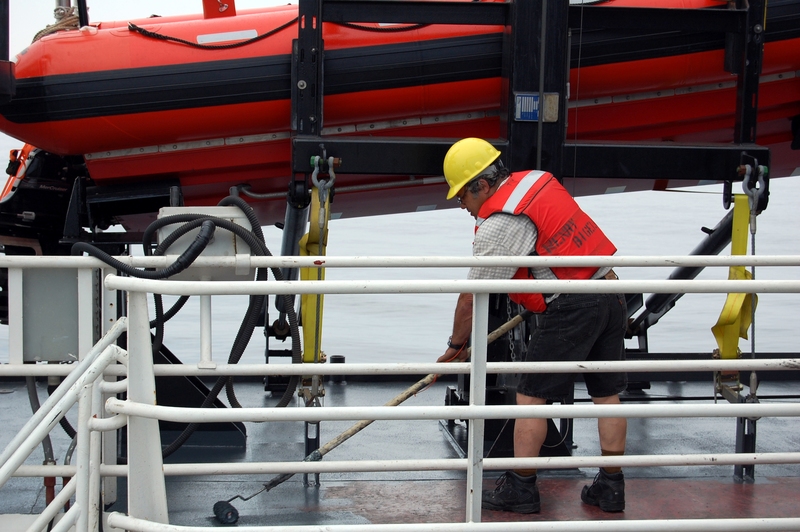 Deck crew member Tony repaints the deck after grinding off the old paint while we are underway. 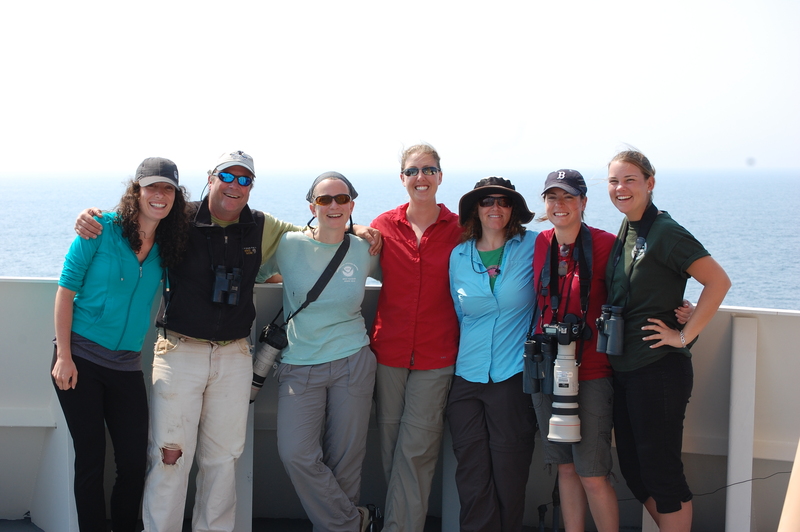 We spend most of our days out on the fly bridge watching for whales, and mostly we see whales. 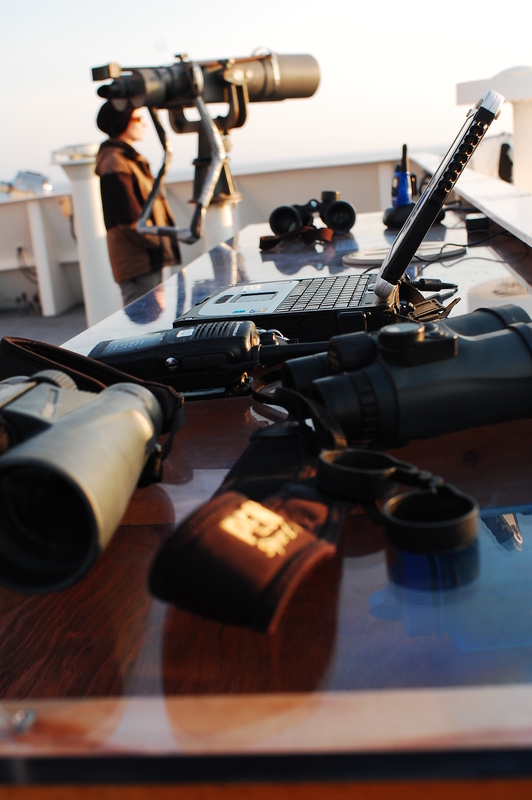 Equipment used for watching for whales from the flybridge. 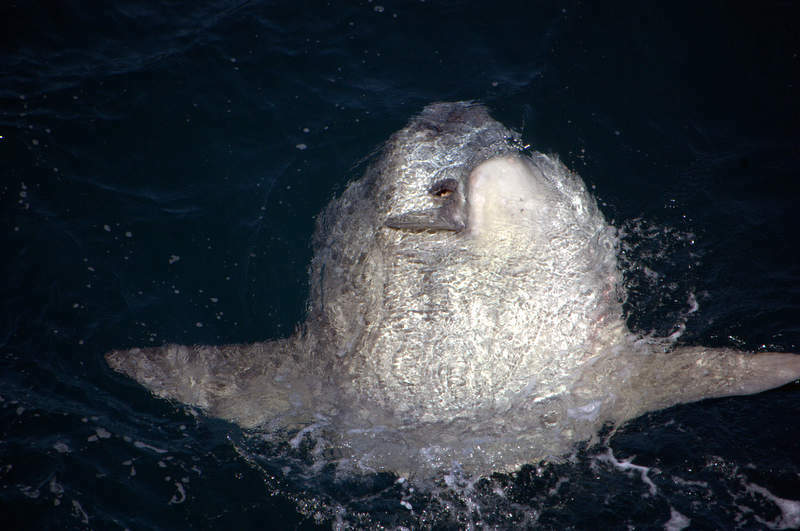 However, once in a while a shark, turtle, or mola mola floats by. I really get a kick out of the mola molas. They look like they could be the subject of a Pokemon trading card– a big flat fish head with fins sticking out. They eat jelly fish and have few natural predators. Adults weigh an average of 2200 lbs! This entry was posted in 2012, Alexandra Keenan, NOAA, NOAA Fisheries Service, NOAA Teacher at Sea and tagged acoustics, Atlantic Ocean, bioacoustics, Henry B. Bigelow, humpback whales, MARUs, Mola mola, NOAA Fisheries Service, NOAA Teacher at Sea, passive acoustics, sperm whales, teacher at sea. Bookmark the permalink.